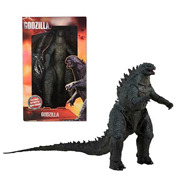 A Monster of a Gift Idea - Godzilla Toys and Collectibles! "Gigantis." The worldwide pop culture icon has appeared in over 30 films, plus comic books, novels, television shows, and video games. Godzilla merchandise abounds, so there's no shortage of Godzilla toys, action figures and other fun stuff. Recognized by Guinness World Records as the longest continuously running movie franchise, Godzilla is a multi-media series featuring a giant monster known as "Godzilla," "The King of the Monsters," and "Gigantis." The worldwide pop culture icon has appeared in over 30 films, plus comic books, novels, television shows, and video games. Godzilla merchandise abounds, so there's no shortage of Godzilla toys, action figures and other fun stuff. Godzilla was first released by Toho in 1954. 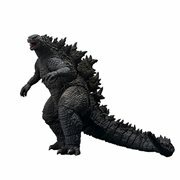 The monster monarch is more popular than ever today, as evidenced by Toho's Shin Godzilla in 2016 and the Godzilla: Monster Planet anime film in 2017, and Legendary Pictures' 2019 Godzilla: King of the Monsters and 2020 Godzilla vs. Kong. Cuddly plush and tons of other items based on these and the previous films have been produced. 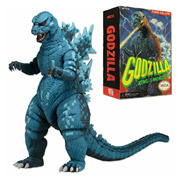 The many changing looks of The King of the Monsters are featured - as are Mothra and his more famous opponents like Biollante, Mechagodzilla, King Ghidorah, Gigan, Destroyah, Hedorah, Titanosaurus, Anguirus, Battra, Baragon, and Ebirah - in Godzilla sofubi, Pop!, and other vinyl figures available for the big guy's many admirers… like you! Life Will Never Be the Same with Gigantis in the Room! 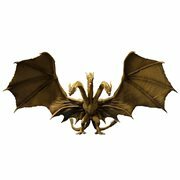 When you invite a humongous monster to become part of your décor, things change… for the better! That's why many kaiju fans and collectors choose to display an attention-grabbing Godzilla statue in their abode or office. Honestly, can you think of anything more impressive to show your friends or coworkers? There Are So Many Fun Ways to Feed Your Fandom. 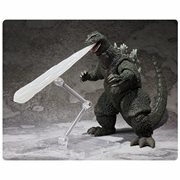 Other enthusiasts select from the large selection of T-shirts, posters, banks, bottle openers, costumes, travel mugs, slippers, games, masks, model kits, Godzilla mini-figures, and other memorabilia they discover at Entertainment Earth. 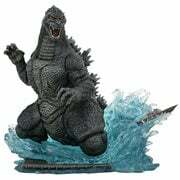 Whether your interest lies in Godzilla vs. Mechagodzilla, Godzilla vs. Destroyah, Godzilla: Final Wars, All Monsters Attack, Godzilla vs. SpaceGodzilla, Invasion of Astro-Monster, the 2014 Godzilla movie, or any of the many other films and media, the odds are you'll find a fantastic bobblehead or other irresistible items right here. See for yourself!